This post was originally published in early December with the title "Brain, Where did you GO?" I can now tell you. 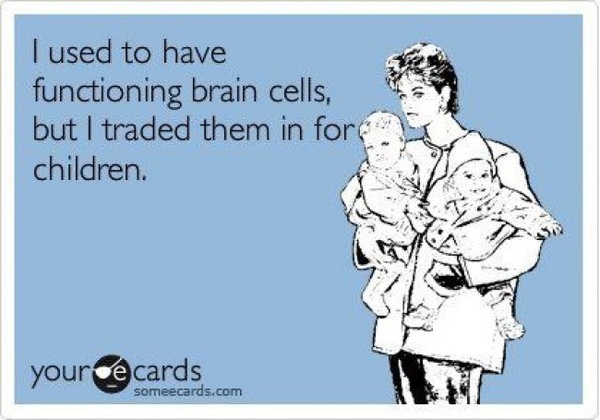 My brain is currently being held hostage by my two children. They are unwilling to negotiate. But I did notice a decline in the Swiffer the other day, and I DID know what to do. So that's something. I swear, I'm not a dumb person. I was bordering on "dork" in school. I've got a great memory, which was really helpful when I was doing shows, or studying, or whatever. I graduated THIRD in high school and had a scholarship to UConn. Trust me though, I'm not bragging. Lately, that's getting hard to defend. There have been a few instances where I really question if I have a single brain cell left. I thought pregnancy brain is bad, but IT DIDN'T GO AWAY. And honestly, it got so much worse. Today there were a few instances. I brought Madison to dance class this morning. (Yes, I did remember Madison, her dance gear, and her sister). It's a drop off/wait class, so I have about 45 minutes to kill in the waiting area. A lot of that time is playing with Reagan as she attacks the other babies, but I do usually bring something else I need to get done. Today I brought coupons to clip, and Christmas cards to stamp. Just coupons (no scissors or coupon envelope) and Christmas cards (no stamps). Right. When I went out to the car to find some stamps and my coupon envelope, I unearthed something else. Birthday cards for both my mother and father. Which would be great if they had birthdays in December. But they don't. They have birthdays in November. My Dad's was EARLY November. OVER a month ago. 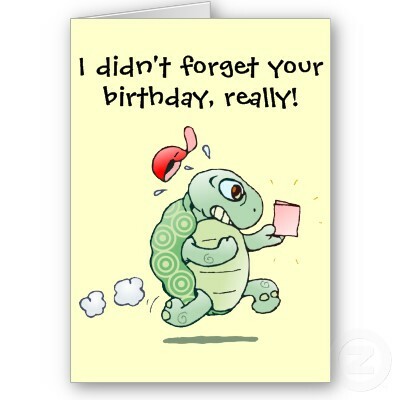 It's not even like I need a card that says "I forgot your birthday". Or even one that says "I forgot to get you a card". I forgot to MAIL THE CARDS. TO MY OWN PARENTS. I bought these cards back in OCTOBER. I swear. I had the girls scribble in theirs, signed them, and put them in my purse so I could mail my Dad's once I picked up stamps. I thought I mailed my Dad's when I paid the October bills, but clearly I didn't. I found them a few days after his birthday, but instead of mailing them late, I figured I'd give them BOTH their cards when Adam and I took them out for dinner in mid-November. Clearly I didn't. So I figured I'd make sure to give them the cards at Thanksgiving. Oops. And my niece's Christening. Oops. So today I put all four cards (which are addressed to be mailed, though unstamped), wrote a groveling note, and stuck them all in a mailing envelope. I did manage to mail the Christmas cards today, and I put that envelope in the mail too. After I finished the card debacle, I took the girls to BJs (yes, that's the real name of the store. It's a warehouse club. Like Sam's. Or Costco.) We were lucky enough to score a parking spot right next to the cart corral (the REAL prime spot for moms). We shopped, we paid, I got (almost) everything I hoped to. Then we got to the car, and I did the post-store dance of "what gets in the car first". When you have small children, a purse and a cart full of merchandise, it's tricky to know what order to unload in. Kids first? Which one? Stuff first? Purse first? I opted for this order: big kid, little kid, purse. Yup, I very nearly drove away with a cart full of purchases put neatly in the cart corral. Thank GOODNESS I remembered before I actually pulled out of the parking space. But the car was in reverse, I was buckled, and I was ready to go. So I came home, put the girls down for a nap, and started cleaning. Monday I do the downstairs floors. I moved all the furniture and vacuumed. Fine. I pulled out the Shark (my Black Friday purchase) and steam mopped. Then I sat down with my Swiffer Wet Jet to fix it. I'd been struggling with it for a few weeks. It stopped spraying the solution and I could NOT figure out why. I have the Shark, but sometimes I just want to do a quick mop without having to plug anything in, or heat up water, or whatever. There were times I actually got down on my hands and knees to scrub up a spot, and THAT is just unacceptable. 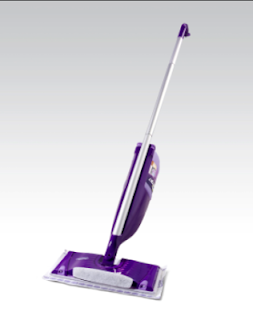 It's a perfectly good mop, I only got it a few months ago, and if it's broken, I'm either going to get a new one, and quite possibly write an angry email to Swiffer for creating a shoddy product. So I started taking the mop completely apart. I figured there must be a kink in the tubing or something. I'm glad I figured it out before taking out tools. As I was struggling to pull the handle apart I noticed a panel that said "slide to open". Huh. PLEASE tell me I'm not the only one who didn't know this. And PLEASE tell me I'm not the only one whose brain cells are slowly trickling out since having children.